This lecture course is given to 1st-year master students from all design fields present in the college. China is undergoing a rapid state of development and will still create a huge amount of built artifacts in the decade to come. However, the development mode and policies of the 20th century start showing frightening consequences and humanity is dealing with increasingly monumental environmental and social problems. Thus, sustainability issues have come to the forefront of design in the last 30 years and developed from a laughed-at trend to a crucial aspect of our profession today. The current trend towards sustainability can be observed in all design fields; not just for resources, energy and emission aspects, but in social, equality and health issues as well. This means that all design clients are increasingly insisting on sustainable and “green” products and services. The question is, whether we designers will be able to deliver. Will we possess the necessary knowledge, skills, and tools to solve the intrinsically complex nature of the countless sustainability issues in our design practices in order to create a truly sustainable society? We believe that only designers who can react to climate change, resource scarcity, energy costs, water shortage, environmental refugees etc. will be able to stay in business, as other design aspects will become irrelevant. A basic understanding of the matter is thus indispensable for soon-to-be professionals. The goal of this course is to make the students aware of the reality, urgency and severity of today’s sustainability issues. The course shall also offer theory and knowledge on how to create design that is more sustainable. The study shall build a solid consciousness and foster critical thinking in the students in order to investigate further on sustainability and ecological issues throughout their professional life. This fundamental insight will allow students to communicate with experts of different disciplines and to discuss these questions with clients and consultants. The course provides understanding in pertinent sustainability aspects and their systemic relationships in regard to design and life quality. The course tries to deliver as much overall ‘big picture’ observations as well as minute aspects, both equally crucial in their own right. We will discuss the relation between design and waste, energy and material issues, technology and processes, human comfort, the relationship of nature, ecology and cities, and many other topics and their intricacies as they relate to aspects of design and human life. Furthermore, this course imparts diverse methods, systems, structures, and processes for achieving more sustainable design. Examples of methodical evaluation and assessment will be communicated. Processes for identifying needs, opportunities and constraints of project, users, context, markets and place as well as relevant passive and active techniques and how to use them constructively toward more sustainable design will be conveyed. We will train the ability and tools to critically assess available technologies and best practices, recognizing potential problems and solutions. The communication of knowledge and expertise will mostly occur through lectures, which employ case studies, research and insights from design practice and academic work. Students’ study process will be supported by readings, tasks and real-world observations. The assimilation, comprehension and integration of this new knowledge will occur in discussions, student presentations, exchange and self-study. 3 book titles are provided below, from which each student must completely read at least two books. An extensive list with sustainability books is furthermore distributed, from which each student should read about 2-5 books of his/her own choice at the beginning of the semester. Class time and non-class time make up about 1/3 and 2/3 respectively of the total work time of this course. No examination will be held in the final two exam weeks. Students’ performance will be assessed through 100% course work assignments. 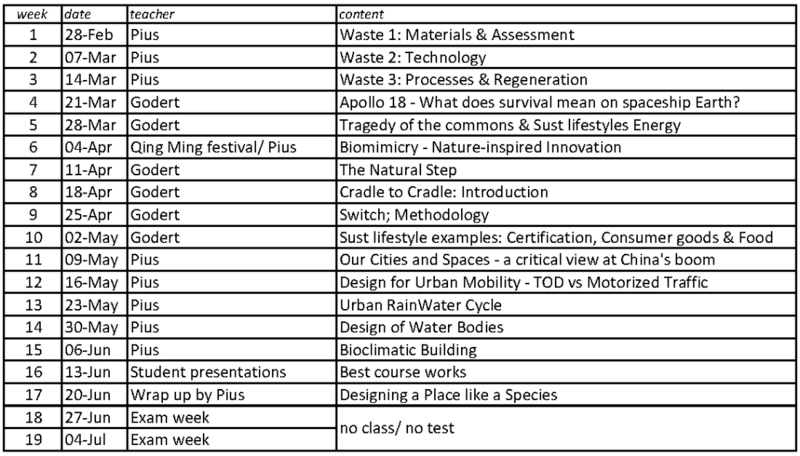 Assignments will be based on lecture contents, the students’ current studio projects and current issues of sustainability. Assignments may encompass self-study and observations, text reviews and critiques, case studies, etc. Class attendance of at least 80% is required to pass the course. Class involvement and contribution may significantly raise a student’s grade and will be used to correct grades up or down. A written explanation to the coaching team is appreciated in case of justified non-attendance. Depending on the assignments, each student will receive group grades and/or individual grades that are weighted according to importance and their average will constitute the final grade. The final grade may be adjusted based on aspects below. This course treats design as a field of ongoing research and creativity. Thus the students are invited to propose novel and innovative ideas and concepts, based on thorough study of feasibility and the life-quality and sustainability issues at hand. The creation of a report, presentation and/or written document is also considered a design task. Submittals are not supposed to be fancy or expensive, but the thought that is put into content choice, layout, structure, appearance, level of associations, mental links, etc. may significantly affect the grade. Sustainability is a complex field and you will be partly graded on your ability to organize and structure your learning as well as your way to communicate your understanding, research and concepts to others. Know your subject and details and still keep it simple. Credits will be awarded to accuracy, conciseness and clarity of expression. Plagiarism (copying) is strictly forbidden. Acknowledgement must be given to any and all sources of information used to produce any of your work. Class involvement and contribution may significantly raise a student’s grade. Class attendance is expected throughout and random records will be used to correct grades up or down. A written explanation to the coaching team is necessary in case of justified non-attendance.